The speculation continues into the death of megastar Whitney Houston. Reports are now surfacing about the prescription bottles that were found in her hotel room. (TMZ) Law enforcement sources tell TMZ ... multiple prescription drug bottles were found in the Beverly Hills hotel room where Whitney Houston died ... but we're told there were NOT a lot of pills at the scene. Among the prescriptions ... ibuprofen (painkiller), Xanax (anti-depressant), Midol (for menstrual cramps), amoxicillin (for treating bacterial infections) ... and more. We're told the amoxicillin was prescribed recently because Whitney had been suffering from a sore throat. We're told some of the prescriptions were old ... some issued in 2011 ... but some of the bottles were from 2012. We're told the pill bottles that were recovered at the scene did not contain a lot of pills. Sources tell us ... some of the prescriptions were filled at the infamous Mickey Fine pharmacy in Beverly Hills ... where Michael Jackson had numerous prescriptions filled for Demerol and other drugs. 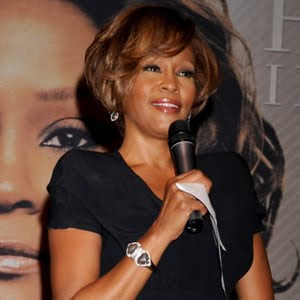 Law enforcement sources tell us ... it's possible Whitney suffered a heart attack caused by an adverse reaction to her medication, but it is simply too early to make an official call on the cause of death. Thank you for the tributes- to me, the protestor who spent a lifetime counselling addicts and am an addict meself- i feel the media will not cover this in any depth- as they did not Michael...ot black nor white media! Nothing but platitudes and cliches: o, she was ready for a comeback, etc. Actually, I am proud to be an addict in the sense Baudelaire meant- when he said- "be addicted to something- even to virtue...but...be addicted!" In other words- be passionate. To a degree, the addict, like poet Sylvia Plath- developes a skill for dying! The addict can be a series of relapses getting worse. Let's not plaster things over with boosterism, shall we? Do they interview counselor's at Whitney's rehab clinics to find out what demons she had?- why did she keep on changing color (as did Michael) which they will not cover-having to change hair styles once a week, her appearance once a year?? a chameleon? Do they interview other artists that cld share light- especially the ones that have had similar problems? do they interview the dealers? I, (and other persons on this site who have "been there") cld cover this death better than the media- i think- agree? disagree? Certainly the money and the enablers it buys- plays a big part- but what- in Whitney- was so painful that she had to self medicate? in Michael? still a big mystery. Especially when they could buy the world and had big talent? Of course- America? that's not covered by most media either. Especially the dark side!